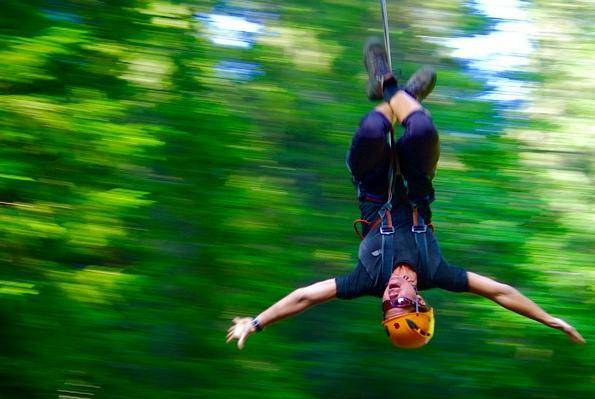 Zipline is for those who are looking for a real adrenalin rush! Here you fly forward at high speed and sometimes 60 meter up in the air. The course contains four different routes where the longest takes you on a 350-meter-long experience. No previous experience is required. The minimum weight is 50kg and the maximum weight limit is 100kg. Dress according to the weather conditions, be aware that we will be out in the woods so wear proper shoes / boots, waterproof if it is wet. You´re unable to bring any bags or SLR because we will wear full body harnesses. This course is for those who are looking for a real adrenalin rush! Here you fly forward at high speed and over the Susa stream ravines, sometimes 60 meters in the air. The zipline contains four different routes where the longest takes you on a 350-meter-long experience!